uropean interest in goods produced in the Orient stimulated a search for sea routes to Asia, around Africa and across the Atlantic. The Treaty of Tordesillas, sanctioned by the Pope in 1506, divided the Atlantic and Americas between Spain and Portugal. This was a hindrance to English mercantile ambitions, but England could not directly challenge the two dominant maritime powers. The proposed solution was to find a northern passage between Atlantic and Pacific that avoided Spanish and Portuguese territories. A series of maps produced between 1520 and 1570, based on a combination of imagination, theory and fact, show the development of this idea of a northwest passage. 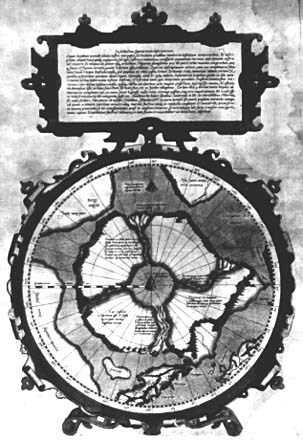 The earliest suggestion of the existence of a northwest passage appears on the globe produced by Johannes Schöner in 1520. It shows straits to the south and to the north of "America", each separating "America" from other southern and northern land masses. 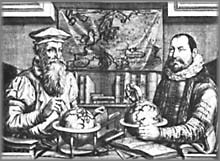 The Ambassador's Globe, created some time between 1525 and 1553, more clearly reveals a northwest passage, and is suspected as being the prototype for the passage depicted by later mapmakers such as Frisius and Mercator. A map (1529) by Girolamo da Verrazzano led many to believe that a shorter, easier route to Asia existed. It was based on a voyage his brother had undertaken in 1524 for France, along the east coast of North America. This model too was copied by mapmakers for many years. 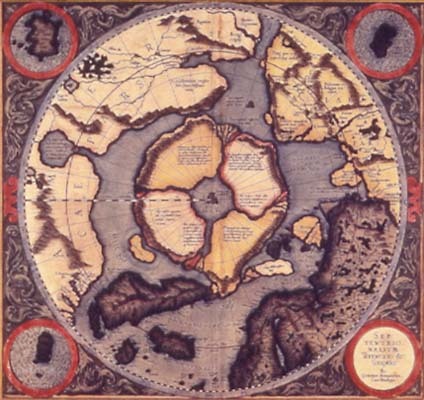 In 1531, Oronce Finé, professor of mathematics in Paris, produced the first map to show four Arctic islands with a north polar sea and a separate island of Greenland. 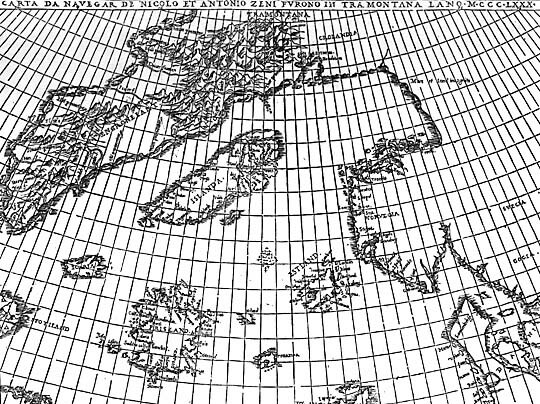 For centuries, other mapmakers - such as Mercator - copied these features onto their own maps. The idea of a northwest passage continued to develop through the work of Gemma Frisius. Having access to Portuguese and Spanish map sources, he accepted that the Corte Real brothers had travelled through a northern strait from the Atlantic to the Orient (1500-1502). 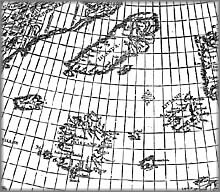 On his 1537 globe, he called the northern strait "Arctic strait of the three brothers". 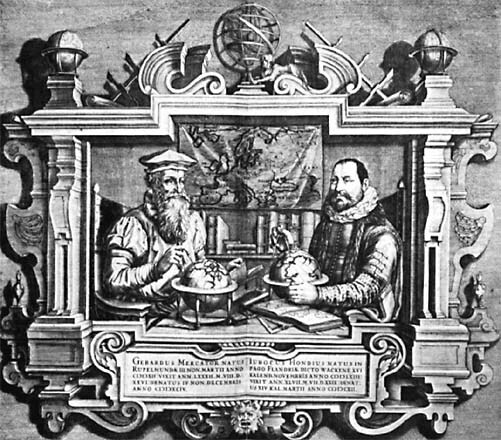 His work, particularly this globe which his student Gerard Mercator helped to construct, was well-known in England. A map (1558) by Diogo Homem of Portugal was commissioned by Queen Mary and completed, after her death, at the request of Queen Elizabeth. It was based on French exploration (mainly Cartier's) between 1534 and 1544 and focused on the northeast American shoreline, the St. Lawrence Gulf and River. He depicted North America as a narrow continent with many straits leading to the Pacific. By contrast, a map by Bolognino Zaltieri, in 1566, showed North America as a huge land barrier which could only be bypassed via a northern passage. Also in 1558 Nicolo Zeno produced an influential map of the North Atlantic, supposedly based on ocean voyages by members of the family in the 1380s, although we have no other evidence of such travels. It placed most features at too northerly a latitude, causing later cartographic confusion and leading Frobisher to think he had visited the island of "Friesland", when in fact it was Greenland. It was Mercator's work that made the theory of a northwest passage more popular. Already by 1538, the date of his first world map, he was becoming widely known and respected. His world map of 1569 was one of the greatest compiled up to that time. Abraham Ortelius' world map of the following year was part of a pioneering compilation, essentially the first modern atlas, and was also important in the history of cartography. Thus, those who conceived, planned or invested in the Frobisher expeditions could potentially have been influenced in their decisions by seeing any of a series of maps showing differing versions of the Northwest Passage. Some mapmakers built on what their predecessors had produced, while others generated their own theories entirely.